Choosing the Right Winch: A Buying Guide | Blog | Compresstech Resources, Inc.
You’re thinking of getting a winch, but with all the options on the market today, you’re not sure where to start. How much weight should your winch be able to pull, for one? And what will be powering it? 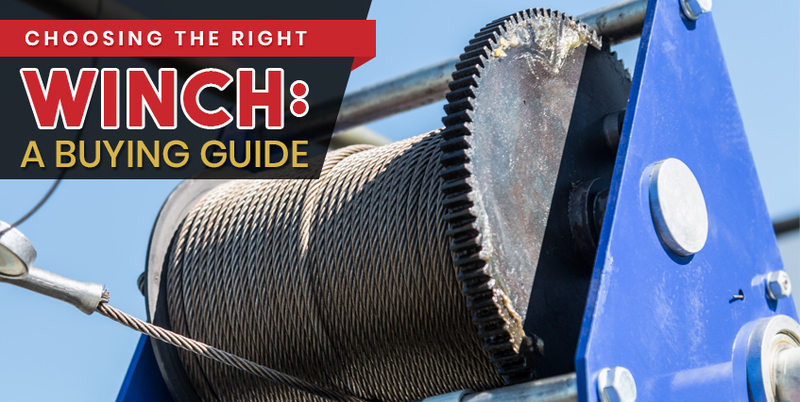 To help you start your search for the right winch, here’s a streamlined step-by-step buying guide. Your winch should be able to pull your car, first and foremost. A heavier vehicle will need a bigger winch. To calculate the ideal capacity for your winch, first sum up the vehicle’s base weight, passenger weight, and cargo weight to get the gross vehicle weight. Multiply this by 1.5 and you’ll know how the capacity you’ll be aiming for as you shop for winches. For instance, if your vehicle weighs 4000 tons including passengers and cargo, you’ll need a winch that can pull 6000 tons. NOTE: The 1.5 multiplier is an industry rule. Depending on specific needs, like if you’ll be going up inclines, you’ll be needing more pulling power. It’s also advisable to get a winch that can pull a bit more than exactly 1.5 times your vehicle’s weight, to be sure. Read more about each type by checking out Part 1 of our beginners’ guide to winches. Winches can be classified into three based on their power source. Hydraulic winches draw power from the vehicle’s power steering pump, while electric winches tap into the vehicle’s battery power. There are also manual winches, which simply need to be cranked to work. Electric winches are more common because they tend to be less expensive. However, they can overheat after prolonged usage. It will also draw a lot of power from your vehicle, so be sure that the battery and alternator can deliver the amperage your winch requires, even with the vehicle’s lights switched on. Meanwhile, hydraulic winches are suited for repeated and prolonged usage. They can be used in areas with mud or water, and they aren’t affected by low battery power. You’ll just have to keep your vehicle’s engine running to power the winch. Manual winches can pull up to two tons using the power from your own arms. They’re suitable for smaller applications, such as loading boats onto trailers or pulling light loads. When buying a winch, you will have to pick between steel cable or synthetic rope to go with it. Steel cable is more resistant to abrasion and exposure to chemicals, but it can form burrs which can cut your hands. It also presents a genuine hazard if it snaps violently. Meanwhile, synthetic cables are stronger and safer to use, but they have to be replaced regularly as they are prone to abrasion and chemical damage. For a fuller picture, you can take a look at this comparison of steel and synthetic winch ropes. With these four steps, you should be able to pick out two or three winches that best suit your application. Give yourself some allowance in your budget for a high-quality winch, and you can get the best performance from your trusty new equipment. Why not browse our selection of world-class winches for sale, including products from Ingersoll Rand and other international manufacturers? Not only can Compresstech Resources, Inc. offer you the best equipment for your needs, but we can give you expert advice before you make your final purchase. Contact us today to find out more! Found this post helpful? Read more articles about hoists and winches, air compressors, and related equipment by visiting our blog regularly.